If you like penguins—because of their signature waddle, dapper feathers, impressive trills, speedy underwater flight—then get yourself to the New England Aquarium this summer! Not only are there more than 80 penguins to observe bounding, eating, swimming and squawking around their exhibit, but we have a brand new, family-friendly program all about the secret world of penguins! It's called Penguinology, and when you finish your journey you'll be a penguinologist armed with gobs of new information to share about these beloved birds. and measured to make sure it's growing up healthy and strong. 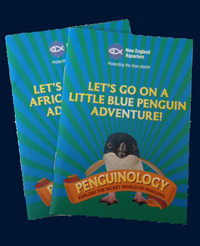 Here's how it works: When you visit the Aquarium, pick up one of our Penguinology guides. Each one delves into prehistoric penguins, unbelievable penguin anatomy features and introduces researchers who are dedicated to helping penguins in the wild. You'll also find a penguin mystery on every page, which is only solved at one of our special decoder stations throughout the building! We're also planning special opportunities for visitors to connect with the dedicated folks who take care of the penguins every day: our penguin biologists. They'll talk about what's going on behind the scenes—and it's all sorts of cute! 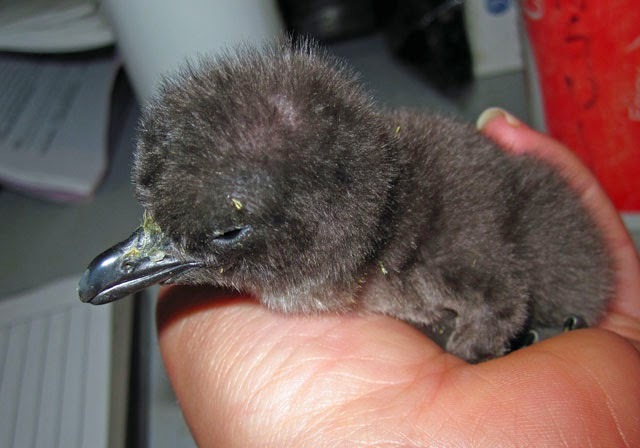 You see, the Aquarium takes part in Species Survival Plans to raise penguin chicks. So right now there are pairs of penguin parents raising chicks in cozy burrows! These daily presentations in the Blue Planet Action Center are your way to learn about what it takes to help these penguin parents raise healthy chicks here at the Aquarium! Inside the 150-thousand gallon penguin exhibit, we'll have our usual presentations and feedings. 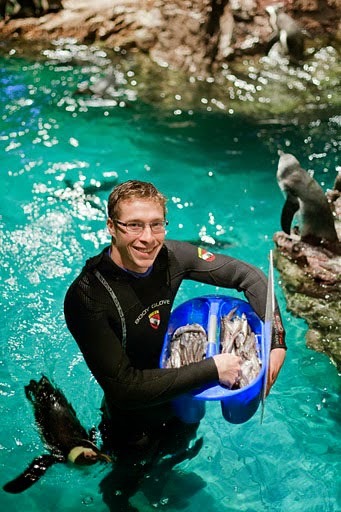 That's when Aquarium staff or volunteers don wetsuits and slip into the 56˚ water to care for and talk about the birds we have on exhibit. You'll learn about the plight of penguins in the wild and what you can do to help penguin species in the wild—where climate change and invasive species are just some of the challenges they face. You'll find wet-suited penguin keepers in and around the exhibit all day. to make sure they're clean and healthy for the birds. The New England Aquarium is your destination for all things penguins this summer. And oh yeah, you'll also find hundreds more marine animals while you're here at the Aquarium, too. From fur seals and sea lions to sea turtles and eels, let a visit to the Aquarium transport you to far corners of our blue planet. Hope to see you around!